Jurgen Locadia's first goal for ten months earned Brighton & Hove Albion a 1-1 draw at home to Arsenal this evening. The Dutch striker scored Albion's equaliser ten minutes before half-time when he rounded Bernd Leno and tapped home into the empty net after a mistake by Stephan Lichtsteiner. Pierre-Emerick Aubameyang had given Arsenal the lead on seven minutes but it was Albion who looked the more likely to claim all three points in the second half. Brighton went into the game looking for their first Boxing Day win since 2005 and Albion boss Chris Hughton made three changes from Saturday's 2-0 defeat at Bournemouth. Shane Duffy returned in central defence for the suspended Lewis Dunk, Dale Stephens came into central midfield for Yves Bissouma and Glenn Murray replaced Florin Andone up front. Arsenal also made three changes as Stephan Lichsteiner, Lucas Torreira and Laurent Koscielny came in for Ainsley Maitland-Niles, Nacho Monreal and Mohamed Elneny. The Gunners came out of the blocks quickly as Alexandre Lacazette had a deflected low shot comfortably saved by Mathew Ryan, before Albion's Australian keeper superbly pushed over Pierre-Emerick Aubameyang's lob after four minutes. The visitors were rewarded for their quick start on seven minutes when Lacazette teed up Aubameyang after Brighton failed to clear their lines and the Gabon striker coolly side-footed home into the far corner. Albion struggled to get going in the opening 20 minutes but went close on 23 minutes when Murray turned Martin Montoya's cross goalwards but was then adjudged to have kicked the ball out of keeper Bernd Leno's hands by referee Anthony Taylor before it rolled over the line. Montoya drove a shot over from 22 yards shortly afterwards and Murray then hit a low effort at Leno after Solly March broke quickly down the right. Brighton were relieved their deficit remained at one on the half-hour mark as Aubameyang raced on to a long ball over the top of Albion's defence and had a low strike from 15 yards brilliantly saved by Ryan. Albion had already come into the game and got on level terms after 35 minutes. Davy Propper launched a long ball forward, Arsenal full-back Lichtsteiner made a mess of things at the back as he looked to head the ball back to Leno and Locadia nipped in to round the Gunners stopper and tap home into an empty net for his first goal since February. Murray headed a Montoya cross over five minutes later as the sides went in level at the break. March had the first effort of the second period as Leno pushed behind his low effort from 20 yards and March then delivered a cross which was headed wide by Propper from ten yards. 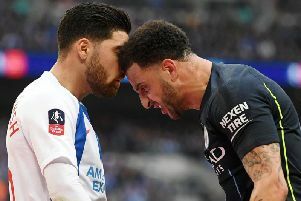 Chances continued to come Brighton's way and they should have gone ahead just before the hour as the ball ricocheted into Propper's path but the midfielder could only fire wide of the near post from eight yards on the half-volley. Aubameyang gailed to connect with Sokratis' long ball over the top on the volley after 66 minutes, before Brighton created another excellent opportunity 11 minutes later. Dale Stephens' ball over the Arsenal defence released March but he lobbed over the bar from 20 yards. Locadia then dragged a shot just wide of the far post from 15 yards, before March's clearance rebounded off Iwobi and flew just wide at the other end. BRIGHTON: Ryan; Montoya, Duffy, Balogun, Bernardo; March, Stephens, Propper, Locadia (Knockaert 86); Gross; Murray (Andone 78). Subs: Button, Bruno, Bong, Kayal, Bissouma. ARSENAL: Leno; Lichsteiner, Sokratis, Koscielny (Maitland-Niles 70), Kolasinac; Torreira, Guendouzi, Xhaka; Ozil (Iwobi 45); Lacazette (Ramsey 60), Aubameyang. Subs: Cech, Elneny, Nketiah, Willock.